What is the relationship between poetry and social change? In the late 1970s and 80s Linton Kwesi Johnson was fighting ‘sus’ laws, standing on picketlines and putting pen to paper to refute W.H. Auden’s claim that ‘poetry makes nothing happen’. In this blog, and in his new book Dread, Poetry and Freedom, David Austin explores Johnson’s work through the radical political and poetic traditions it engages with, drawing on Johnson’s dialogue with reggae and Rastafari, Aime Cesaire and Frantz Fanon, C.L.R. James and Walter Rodney, and W.E.B. Du Bois. 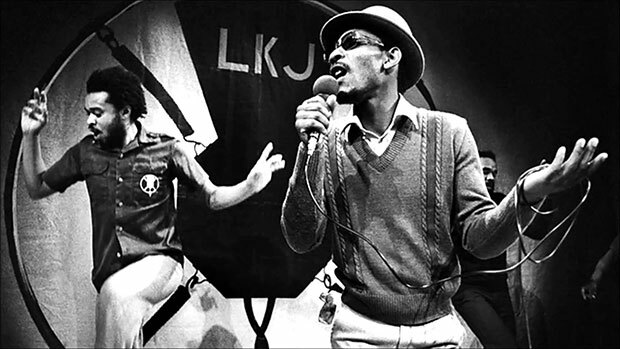 There are not many artists like Linton Kwesi Johnson, and few have been as effective in blending creative talent with politics. Since his emergence on the poetry scene in the 1970s, Johnson has produced some of the best received and bestselling reggae recordings of his generation. He has developed a following throughout the world – South Africa, Japan, Brazil, among other places – and he is particularly well known and respected in France, where he has performed before thousands, as well as in Germany, Italy and other parts of Europe. His poetry has also been translated into German and Italian, and in 2002, a collection of his poetry was published under the Penguin Modern Classics series, making him only the second living poet at the time to be published in this series (the Polish poet Czesław Miłosz is the other). Johnson has influenced a whole generation of poets, hip-hop artists and political activists. In Britain, he has been described as ‘the most conscientious godfather’ of black British arts, and in 1987 he was nominated for a Grammy for the album LKJ Live in Concert with the Dub Band. Listening to Linton Kwesi Johnson for the very first time in 1993 was a thoroughly new experience for me. First, the reggae music that accompanied his ominous verse was mystical and foreboding, but also decidedly urban compared to the Jamaican-based reggae that I grew up listening to as a child in the South London district of Peckham and in the streets and record shops in Brixton. The music gripped me as if I had been transposed into the place and time in which his poetry and music was set. Second, the cadence of Johnson’s monotone baritone voice was also surprisingly sonorous and his haunting chants had an almost wailing effect, reflecting the pain, suffering and woe of the people ‘down below’, that is to say his generation of black youth in Britain and the sufferers in Jamaica. His poetry not only resonated in Babylonian Britain where black youth confronted brutal police officers and their batons, but across the Atlantic in Canada where, in Montreal and Toronto, police killings of black youth were carried out with impunity. In fact, unbeknownst to me at the time, the then Montreal-based Bahamian poet Michael Pintard had adopted a line from Johnson’s ‘Reggae fi Peach’ to highlight the killing of black youth in the city. Such was the allure of the militant tone and the pulsating baseline of the musical accompaniment to his poetry that he had developed an underground following among young punks and skinheads in the UK. Third, Johnson’s verse was graphic, vivid and very compelling, and despite his adept deployment of metaphors he left little doubt as to his thoughts on the internecine violence that had cast a shadow over London’s black youth, and the all-too-common brutal police attacks on young blacks. The 1981 Black People's Day of Action. There were obvious parallels between Johnson’s analysis of violent phenomena in Britain and Frantz Fanon’s The Wretched of the Earth, and particularly the first chapter of that book, ‘On Violence’. The similarities were too conspicuous to ignore, and later I discovered Johnson’s 1976 essay, ‘Jamaican Rebel Music’, published in the UK journal Race and Class, in which he outlined the parallels between Fanon’s phenomenological probe of violent phenomena under colonialism and his own assessment on the contemporary conditions in Jamaica. This now classic essay on the sociology of reggae not only confirmed my suspicion that his poetry has been profoundly influenced by Fanon’s prose, but it also alerted me to his ability to step outside his art and analyse some of the very themes that his poetry addressed, but this time in poetic prose. Linton Kwesi Johnson is not only a poet. He is, or at least has been, a political engagé, a French word that in this context is preferable to activist, as the latter has a ring of professionalism as if to suggest that ‘activism’ or activist work is a special vocation that only a select minority can undertake, as opposed to being engaged out of political necessity. Johnson has been actively engaged in grassroots political work since the early 1970s. His political life has infused his poetry, permitting an organic legitimacy that has nourished and sustained his art over the years and that is evident in his description of the plight of black British youth in England and the emergence of a black British bourgeoisie, as well as in his accounts of working-class struggles, the rise of Solidarity in Poland, the demise of the Soviet Union and the Eastern bloc, and the future of socialism. It is hard to imagine another poet who has contributed more to our political understanding of such a wide range of political events and phenomena, qualifying him, in my estimation, as a ‘political poet par excellence’, an accolade that he once accorded the esteemed Guyanese poet Martin Carter. The memorial march following the murders of Blair Peach and Gurdip Singh Chaggar. Johnson’s early poetry forewarns of a new day, at times anticipating violent reactions to colonial oppression in Britain, at other times blending a Jamesian socialist critique with biblical metaphors deployed as an artistic and political motif, as he does in the poem ‘Di Good Life’. His poetry reflects, but is in no way reducible to, the sum total of the personalities, literary and political figures, and experiences that have touched his life: from his grandmother and the Bible during his childhood in Jamaica, the poetic chanting of the Jamaican reggae chanter Big Youth; the writings of W.E.B. Du Bois, Frantz Fanon, and C.L.R. James whom he discovered as a member of the British Black Panther Party in London, and his involvement in the political organisation Race Today; to the contributions of his mentors in Britain – the poet-publisher John La Rose and poet-novelist Andrew Salkey – and the poetry of Aimé Césaire, Amiri Baraka, The Last Poets and Kamau Brathwaite. When all is said and done, Dread Poetry and Freedom is about social change – the need for dramatic change in our time, and Johnson is the vehicle through which I explore this issue in so far as his poetry typifies Brathwaite’s description of artists as seers or harbingers of change who often perceive and anticipate developments long before they actually unfold; and Aristotle’s description of the universal character of poetry and its ability to ‘to describe what can happen, that is, what is possible because it is either likely or necessary’. Of all art forms, I suggest that poetry is particularly well placed to articulate society’s needs and to at least hint at social developments to come. In some cases, this ability not only reflects artists’ rare gifts but also their freedom to articulate in verse, and particularly in dread or destitute times, what others dare not say, or cannot see. Society often turns to its poets to shed light on the contemporary social situation, to pose difficult questions and, at times, to provide answers, or at least present political possibilities. Great artists are often well placed, even best placed, to assist us as we probe human possibilities, and poets are particularly well suited for this role. Protest for justice for the victims of the New Cross Massacre. ‘A poem is grounded in its time, whether it articulates its consciousness of this or not, and it does not have to manifest a direct awareness of its historical situation in order to be significant and to fulfill a rich definition of poetry.’ But in addition to its context, the poetic image ‘eludes causality’ and is self-created in ways that cannot be reduced to being the product of external influences outside of the poetic images themselves. Poets’ great gifts include the ability to perceive what is often imperceptible to most and to project those observations in artistic form, but they can never be fully conscious of all the various strains, vibrations, events and influences that shape, motivate and compel them to do what they do because much of this creative process often happens behind their backs, leading to ‘something larger than its author’s conscious purpose, and something remote from its origins’, according to T.S. Eliot, one of Linton Kwesi Johnson’s favourite poets. In this sense, the creative imagery of poetry enters into our consciousness as a phenomenon, a phenomenology of the heart and soul, produced by ‘a flicker of the soul’ that grips our being according Gaston Bachelard, images that we internalise they touch our imaginations. The end result is varied interpretations that may differ from the poet’s presumed meaning. Eliot goes as far as to suggest that not only may the reader’s interpretation of a given poem differ considerably form the poet’s, but that this interpretation may be both ‘equally valid’ or ‘may even be better’ than the author’s, and in some instances might provide poets with insight into their own work. All of this provides fertile ground for critical interpretation, including of the particular social-political context that has presumably shaped the poet’s work. While it would be more than presumptuous for me to suggest that my interpretation of Johnson’s poems are even better than his own, and given that this book is grounded in the lofty desire to make a modest contribution towards creating a just and equitable world, Dread Poetry and Freedom is not about Linton Kwesi Johnson’s poetry; or put another way, it is about his poetry in so far as his poetry qua poetry is an expression of politics, or provides poetic insight into politics, premised on the presumption that poets are well placed to inform our under- standing of political possibilities. In this spirit, this is not solely a book of criticism, but is written with what Bachelard refers to as ‘pride’, that is to say a phenomenological ‘soulful’ appreciation of the poet that is partial to the poetic aesthetics of his politics. I certainly take some poetic licence with Johnson’s poetry, and although I would like to think that he would appreciate at least some of this book’s insights, and at the risk of becoming what Sylvia Wynter once described as ‘maggots’ who feed ‘on the decaying corpse of that which gives it a brief predatory life’, my main preoccupation here is to open a space for political reflection through poetry. However, as a meditation on the dynamics of social transformation I in no way want to suggest that social change is inevitable. The insanity that presently governs the world is real, coupled by a technological capacity that almost three decades after the end of the Cold War, still threatens to destroy the planet as we know it. Yet sinking into a calamitous sea of despair is neither desirable nor helpful. Change does not fall from the sky or miraculously appear in a single sweeping, cataclysmic flourish. As Johnson constantly reminds us, it is the ‘each an evry wan a wi’ that makes change and possibilities for change often emerge ‘like a thief in the night’, as a wise man once said, when it appears least likely to. Dread and destitute times can anticipate betters days ahead. Dread Poetry and Freedom: Linton Kwesi Johnson and the Unfinished Revolution by David Austin is available from Pluto Press. David Austin is the editor of Moving Against the System: The 1968 Congress of Black Writers and the Making of Global Consciousness (Pluto, 2018). He is the winner of the 2014 Casa de las Americas Prize.